1. Those who spend all their time obsessing over the next 5-10% correction and when it will happen. 2. Those who are becoming complacent to the risk of a correction or a bear market. Both stances are potentially dangerous because they set you up to over-react to the market’s movements. One of the first things you have to realize as an investor is that to earn a respectable return on your capital, you have to be willing to lose money on occasion — sometimes a lot of money. Just over 50% of all annual periods since 1950 saw a 10% correction or worse. So every other year investors had to deal with double-digit loss at some point throughout the year. 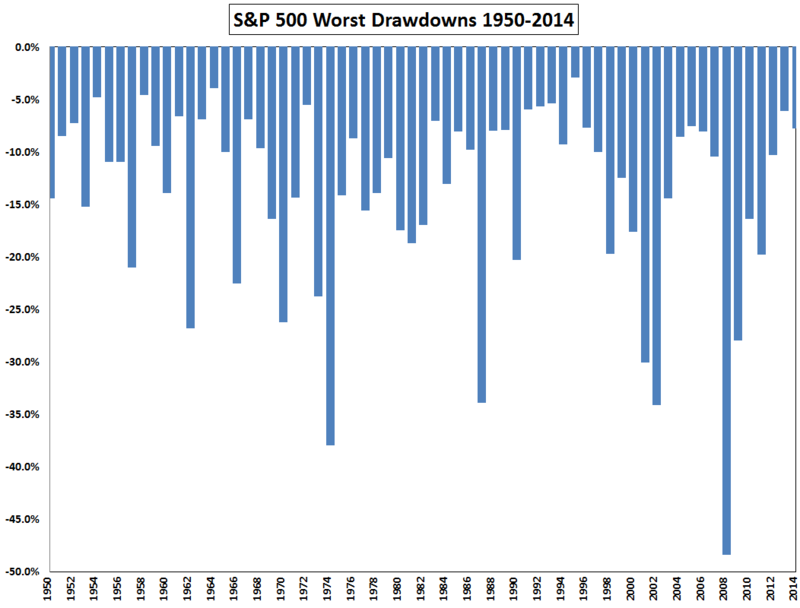 To be specific, there were 34 years with a double digit drawdowns. But 20 of those periods actually finished the year with a gain. So almost 60% of all years with a drawdown in excess of 10% still finished the year in positive territory. This includes three years that finished the year with a gain despite the fact that they experienced drawdowns of -25.9%, -27.6% and -33.5%. Here’s another stat for your next cocktail party: Since 1950, the S&P 500 has never finished the calendar year with a loss when there wasn’t a double digit correction at some point during the year. So in 31 out of 65 years in this sample set, stocks finished with gains every single time when they managed to avoid adouble-digitt drawdown. These are the types of streaks that are made to be broken, but I find this one interesting nonetheless. 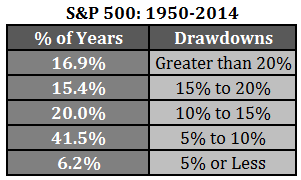 Despite all of these drawdowns, stocks still finished this period with an annual gain of around 11% per year. You can’t be involved in the stock market without dealing with losses at some point. They’re an inevitable part of a marketplace full of participants with different opinions and expectations. You have to learn to handle these periodic losses with equanimity if you’re ever going to succeed as an investor. Excellent point—-one which many investors too often forget.